Three Years after the Fukushima Nuclear disaster several Southeast Asian governments have revived their nuclear plans, with Vietnam leading the way for six nuclear plants. The moves have been galvanised by Japan’s U-turn to retain nuclear energy after initially wanting to phase out nuclear power plants after the 3-11 disaster. 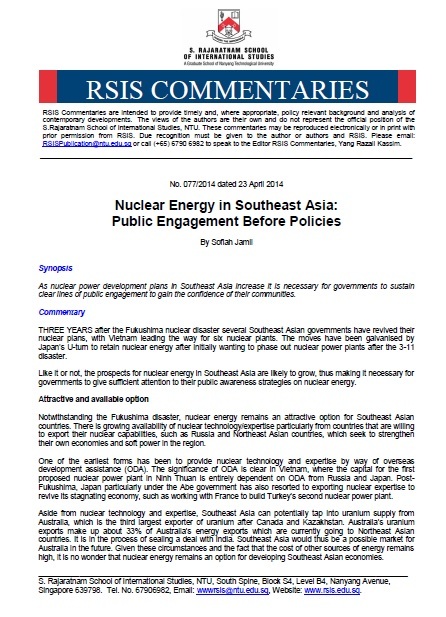 Like it or not, the prospects for nuclear energy in Southeast Asia are likely to grow, thus making it necessary for governments to give sufficient attention to their public awareness strategies on nuclear energy.